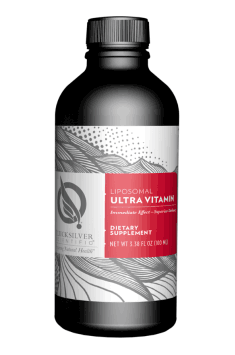 Quicksilver Scientific Liposomal Ultra Vitamin is a dietary supplement containing a complex of vitamins with the addition of antioxidants in the liposomal form. Encapsulation of the supplement in phospholipid encasements allows to maximize the absorption of the ingredients at each stage of the digestive tract, thanks to which it will be possible to fully take advantage of the substances. Moreover, thanks to such a form, more effective crossing of blood-brain barrier is possible, which contributes to utilizing particular ingredients in order to support the work of the brain and nervous system. Vitamin A belongs to the vitamins soluble in fats; its most important function is the protection of the vision system and antioxidant effect. Rhodopsin in the composition of the preparation allows to transmit a signal about the presence of light in the brain and the content of β-carotene, which constitutes a precursor of vitamin A, allows to inhibit macular degeneration, which takes place with age. By regulating the work of the immune system at the level of genes, it supports the fight with autoimmune diseases and shortens the time of colds. By decreasing oxidative stress in the organism, it reduces inflammations and lowers the risk of cancer. Vitamin B1 (thiamin) takes part in carbohydrate metabolism, ensuring constant access of energy to the organism. It stems from the fact that it is a coenzyme in the reactions of carbohydrate breakdown. Thanks to this, it also supports the nervous system, as glucose is the main fuel for neurons. Vitamin B2 (riboflavin) in the activated form exhibits key effect for the proper functioning of the nervous systems and mucous membranes in the organism. It constitutes the main precursor of FNN and FAD, which take part in the reactions of oxidation and reduction in the organism, ensuring optimal energy production in the processes of cellular respiration. By cooperating with vitamin A it conditions proper functioning of vision and moreover it supports epithelium of blood vessels, protecting it from the harmful influence of inflammations. Vitamin B3 (niacin), being the component of coenzymes NAD and NADP, regulates the metabolism of carbohydrates, fatty acids and amino acids and extracting energy from them. By influencing fat metabolism, it normalizes cholesterol level, which stems from the fact that it blocks the breakdown of fatty tissue in favor of the utilization of free fatty acids and cholesterol present in blood. Thanks to this, it reduces negative influence of excessive cholesterol level on the functioning of blood vessels and heart. By increasing the level of NADPH in cells, it activates glutathione reductase, which eliminates harmful superoxides. Vitamin B5 (pantothenic acid) structurally it is an amide of pantothenic acid and amino acid - β-alanine. Its main function is the production of coenzyme A and protein carrier of acyl groups. Thanks to this, acetyl-coenzyme A is created, which takes part in many important biochemical reactions. It is also a cholesterol precursor, which is the base for the production of steroid hormones. Vitamin B6 in the form of pyridoxine hydrochloride constitutes a coenzyme, important for metabolizing amino acids. By supporting the production of many neurotransmitters and hemoglobin, it conditions proper functioning of the nervous system and supports channeling oxygen to tissues. Vitamin B7 (biotin) influences the activity of biotin carboxylase and decarboxylase, to which Acetyl-CoA carboxylase and pyruvate carboxylase are also classified – these are enzymes, taking part in the process of gluconeogenesis and fatty acid synthesis. Moreover, it supports the breakdown of triglycerides and vLDL cholesterol fraction, which results from activating AMPK and cGMP in the liver. Thanks to this, it exhibits positive influence on the functioning of the cardiovascular system and protects the liver from excessive hepatic steatosis. Vitamin B9 (folic acid, folate) supports the synthesis of DNA, thanks to which it conditions proper growth and functioning of cells. Its active form supports the process of methylation in the organism and helps to decrease the level of homocysteine, inhibiting its harmful influence on blood vessels. By supporting cysteine metabolism, it regulates the synthesis of such neurotransmitters as: dopamine and serotonin. In its active form it has the ability to permeate blood-brain barrier, thanks to which it supports the functioning of the nervous system and influences cognitive functions. Vitamin B12 in the form of methylcobalamin exhibits neuroprotective effect, thanks to which it improves the functioning of the nervous system. The first important effect on the nervous system is homocysteine reduction in the brain, which leads to the degradation of blood vessels present there. Thanks to this, the vitamin supports proper nourishment of brain tissue. Moreover, it stimulates the repair of damaged nerves and maintaining their functions, which deteriorates with age. Positive influence on the nervous system manifests itself in the improvement of sleep, mood and memory. The presence of methyl group allows to optimize the process of methylation. Vitamin C is one of the best-studied vitamins, the main aim of which is neutralization of free radicals. It appears in the supplement in the form of sodium ascorbate, which demonstrates gentle influence on the digestive tract, preventing unpleasant symptoms in people with sentivie stomach. Vitamin D3 exerts its biological effect after combining with its receptor – VDR, which appears in many tissues, positively influencing the functioning of the whole organism. Its influence on bone structure is especially important. It stems from the fact that it takes part in calcium homeostasis, which constitutes an important building component for bones. Vitamin E is a compound soluble in fats, having strong antioxidant effect, thanks to which it protects organism’s cells from excessive effect of free radicals. Along with coenzyme Q10 produced in the organism it supports the functioning of cardiovascular system, which stems from lowered cholesterol and normalized blood pressure. It also shows neuroprotective effect. Vitamin K2 is a substance soluble in fats, which appears in the supplement in the best form of MK-7. It shows positive effect on the cardiovascular system, which stems from the positive influence of blood coagulation and transporting glutamic acid to arteries, which binds calcium present there and eliminates it, counteracting blood vessel calcification. Betaine anhydrous (Trimethylglycine; TMG) constitutes an active choline metabolite, which allows to avoid unpleasant effect of weaker methylation. This process supports the organism in activating many substances and positively influences the process of eliminating redundant products of metabolism from the organism. As a donor of a methyl group it supports lowering homocysteine level and increases the level of active forms of folic acid. Tocotrienols lower cholesterol level and decrease the risk of the creation of atherosclerotic plaque. Moreover, their reducing influence on infraction and ischemia was proven. By inhibiting blood aggregation, they prevent the creation of clots, which may constitute the source of many problems in this system. Lycopene – a substance from the group of carotenes; it profoundly appears in tomatoes; it is a quite strong antioxidant. It also has the qualities protecting the organism from circulatory diseases and the process of carcinogenesis, however, the mechanism of this phenomenon has not yet been completely discovered. It is especially recommended to men in the risk group of developing prostate cancer. Lutein – a natural pigment from the group of xanthophylls; it has antioxidant properties influences proper functioning of the eyes, as it protects them against damages caused by free radicals; it accumulates most actively in eye lens and central part of retina (yellow spot), which enables central vision and is responsible for visual acuity. Zeaxanthin – yellow pigment; it is one of the two carotenoids in eye retina, where it fulfills a protective function; it supports neutralization of free radicals, appearing under the influence of UV radiation, to the effect of which photoreceptors containing high amounts of polyunsaturated fatty acids from the group of Omega-3 are especially exposed. Summing up, Quicksilver Ultra Vitamin allows to effectively supplement deficits of vitamins important for the functioning of the whole organism. Liposomal formula enables the transport of the ingredients directly to cells, which allows to use much lower doses of the substance in comparison to simple multivitamins, the assimilability of which is scarce. Take 1 teaspoon per Day. Hold in mouth 30 seconds before swallowing. May be mixed into water. Best taken on empty stomach at east 10 minutes before meals. Use within 60 days of Apening. The preparation in the liposomal form constitutes a very good source of vitamins and active substances, which in this form allow to better fight with deficiencies and enjoy good health. The supplement because of the content of substances soluble in water should be applied at least 10 minutes before a meal, which stems from the fact that food content may decrease the level of absorption of many vitamins. Because of the unique compaction of molecules in liposomes it is recommended to store it in the mouth before swallowing. It stems from the fact that many ingredients contained in the preparation may undergo absorption in the mucous membrane of oral cavity. Quicksilver Scientific is a brand which, apart from manufacturing of nutraceuticals and active selling of dietary supplements, specialises in liposomes, heavy metals blood testing and regulating the body’s detoxification process. Dr Christopher Shade, the founder and CEO of the company, patented an innovative method for analysing the extent to which our body counteracts toxic effects of mercury. In addition, he designed unique products based on properties of liposomes which are absorbed quickly and their special structure and size protect them and their contents from damage by digestive processes. To sum up, the main goal of the company is to ensure the best non-invasive support for functioning of the natural detoxification process and effective regeneration of the body by means of advanced and safe manufacturing methods. The preparation enables growth of mental performance, sharpens concentration, improves cognitive intelligence.